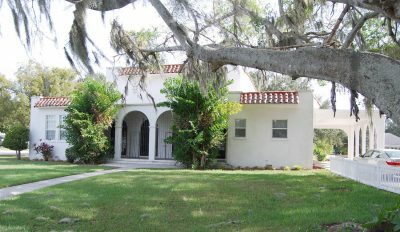 The Woman’s Club of Palmetto clubhouse, 910 Sixth St. W., Palmetto, opened in 1930 and has been a focal point of community social life. In 1986 the building was listed on the National Registry of Historic Places. For 103 years the Woman’s Club of Palmetto has been a leader in service to the community. And with the opening of the organization’s clubhouse in 1930, the landmark building has become an important venue in the history of the North Manatee communities. “The Woman’s Club was very community-minded,” said club President Ann Marshall. “Not only by providing the use of the building to local groups, but with gifts to organizations around town. “And we continue that tradition to today,” Marshall said. To acquaint the community to the Woman’s Club of Palmetto, the organization will hold its annual Christmas Tea from 2 to 3:30 p.m., Dec. 12, at the clubhouse, 910 Sixth St. W., Palmetto. The public is invited, and there is no charge. “We still do a traditional silver tea service with cookies and sandwiches,” Marshall said. “The board puts on this event just to celebrate Christmas. She said the Woman’s Club is a very traditional organization where things are done today as they were years ago. For many years after it opened, the Woman’s Club of Palmetto building was the largest facility for gatherings north of the Manatee River. 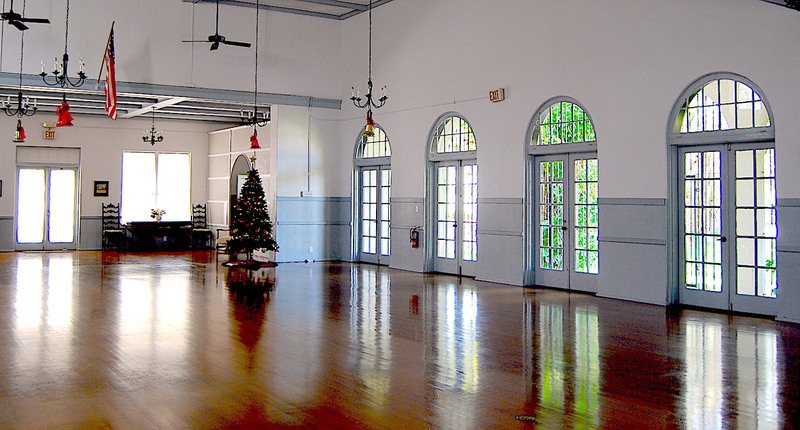 Over the years it was used for school proms, wedding receptions, community dances, business luncheons and other events. The facility continues to be a community hub for many social events. In 1915, many of the women who were members of a beautification committee called the Palmetto Village Improvement Association founded the Woman’s Club of Palmetto. As the Palmetto VIA, the women would do projects to benefit the community, such as distributing trash barrels around town, planting landscapes, and collecting books and renting a room “so young boys would have a place to spend pleasant evenings instead of going to harmful places,” according to a club history synopsis Marshall provided. When the women on that committee formed the Woman’s Club they continued their community service with projects such as helping to equip the Carnegie Library on 10th Avenue West. 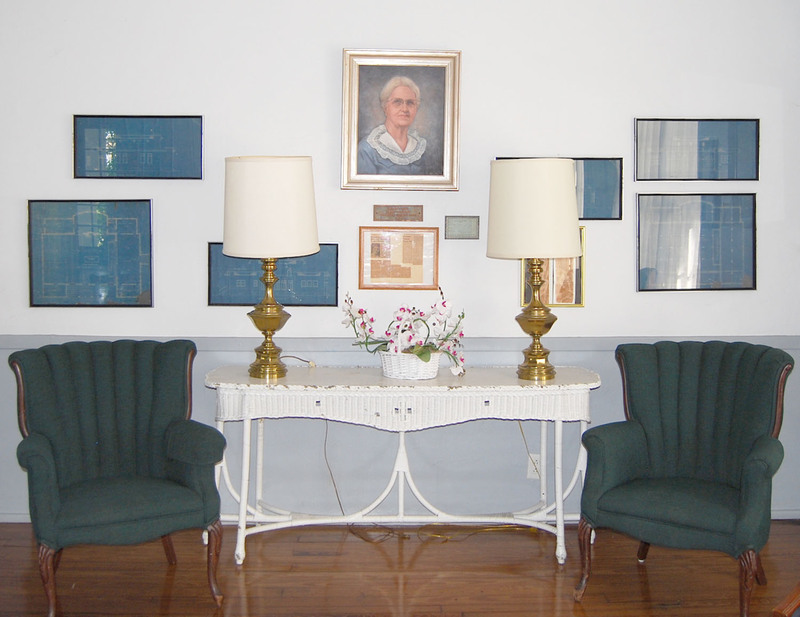 The first president of the Woman’s Club was Linda Mason Lamb, wife of Julius Alexander Lamb, a member of the Palmetto founding family. The women would meet in the lower floor of the Carnegie Library. “At the time that was the only gathering place for a large group north of the (Manatee) River,” Marshall said. To raise money for their community service projects, the women would produce their “annual Follies,” a musical review of operetta scenes and dancing with talented people in the community and schools participating, according to what Woman’s Club historian Alice Myers wrote for the Carnegie Library Archives. Another fundraiser for the Woman’s Club was the dinners they would have at the Palmetto Armory (now the Veterans of Foreign Wars Post 2488 building on Sixth Street West). The Woman’s Club remained active in the community using public buildings for meetings and functions until 1930 when they moved into their own clubhouse on property across Ninth Avenue West from the armory. 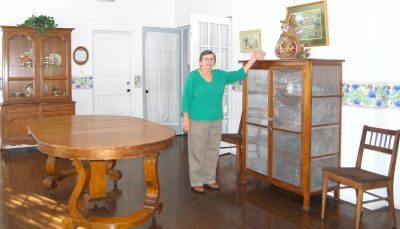 Ann Marshall talks about the décor and furnishings of the Woman’s Club of Palmetto clubhouse. Marshall has been president of the 103-year-old organization for about 18 years. 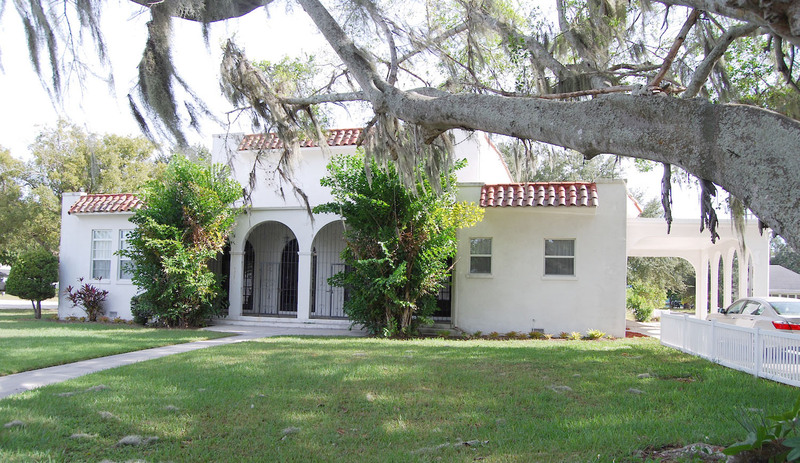 When the clubhouse was constructed there was a stage at the Sixth Avenue West side of the building and a community theater group, which became the Manatee Players, used it in the early 1950s for their performances. During one of the remodeling projects the stage was removed, and the entrance from the west side of the building was moved to the south side facing Sixth Avenue West and a portico added. The rental of the clubhouse has been a major money generator for the club. For many years it was one of the larger venues north of the Manatee River and served as a “civic center” and hub for social life in the community where school proms, wedding receptions, community dances, business luncheons, and other events were held, according to the Myers history. Even today the clubhouse continues to be a centrally located hall where many public organizations and private groups hold functions. “In addition to the building use, we have a scholarship fund and we pick a girl from Palmetto High School to award $1,000 a year to attend South College of Florida for up to four years,” she said, highlighting one of the service projects of the Woman’s Club. “It’s for kids who can’t go to four-year colleges because of their family finances. “We also give to the Just for Girls program, and $1,000 to the food Pantry at the Palmetto First United Methodist Church,” Marshall added. Another service project the Woman’s Club participated in was purchasing Christmas gifts for children served through the Home Instruction for Parents of Preschool Youngsters program or HIPPY. The walls of the reception area of the Woman’s Club of Palmetto clubhouse are decorated with archive documents of the organization and a portrait of one of its founders and first president, Linda Mason Lamb. The Women’s Club has several fundraisers throughout the year. “The Crab Luncheon and Style Show in February is our biggest fundraiser,” Marshall said. “Between 60 and 70 people attend. “We’re still using the same recipe they started out with, but it’s getting harder to get real crab,” she said. In January they have a Card Party and Luncheon where about 60 to 70 women come to play bridge, mahjong, dominoes and other card games. And during Palmetto Heritage Day in March the club sponsors the Chicken and Yellow Rice lunch. The Woman’s Club of Palmetto has about 50 life and regular members. “Our youngest members are in their 60s because we meet during the day, and younger women have to work,” Marshall said. The Woman’s Club meets once a month from October through May, and in June, July, August and September, those who do not go North for the summer meet informally at local restaurants. Another way of recruiting new members for the club is at the November meeting where members are asked to bring potential new members. That was why Marshall joined the Woman’s Club in 1990. “Judy Durrance, one of the longtime members, invited me to attend a meeting,” she said. “I knew how much my mother loved the Woman’s Club and it was a good organization, and I wanted to be part of it. “Working home healthcare, you set your own schedule and I had the time to be an active member from the beginning,” Marshall said. Her parents, Helen and Edward Marshall, retired to Palmetto in 1972. Her mother was a member and treasurer of the Woman’s Club of Palmetto years ago. Her father also helped with maintenance work outside the building. “I’m well-grounded with this organization,” Marshall said. She served as president from 1996 to 2006 and again from 2010 until today. After serving 20 years in the United States Air Force, Marshall retired as a major and moved to Palmetto in 1986 to be near her father after her mother’s death. For more information about the Woman’s Club of Palmetto or to rent the clubhouse, call Marshall at 941-722-8940. The Woman’s Club has no social media presence, but there is an unofficial Facebook page not affiliated with or endorsed by the Woman’s Club of Palmetto at www.facebook.com, just search for Woman’s Club of Palmetto.